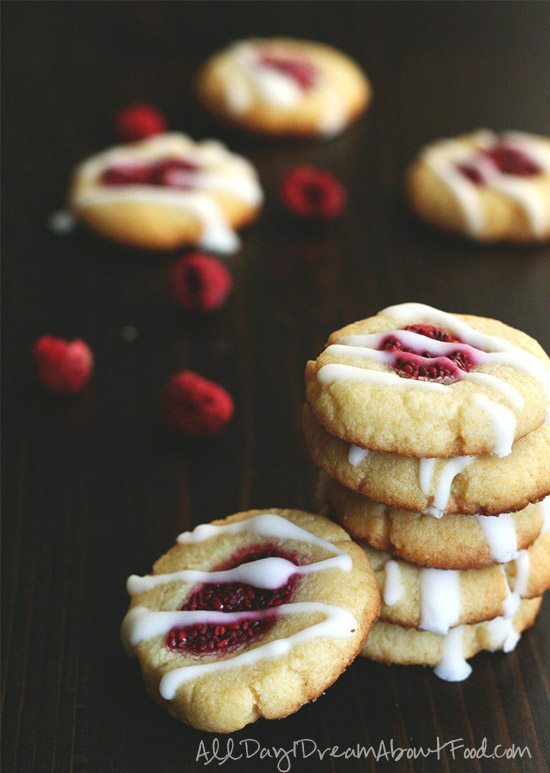 Tender almond flour shortbread cookies filled with sugar-free raspberry chia seed jam. A great low carb treat worthy of a surprise 40th birthday party. I’ve always loved making treats for friends’ birthdays. Ever since I began to bake and cook, I would scheme in advance, thinking of some delicious goodies to celebrate a friend’s natal days. But let’s face it, it’s really just an excuse to get into the kitchen and get my hands dirty. I love my friends, of course, and delight in surprising them with tasty treats, but my motives are not always pure. Because I get great enjoyment out of the creation of said treats and usually I get to partake in the final product as well. So yes, shamefully I admit it. I selfishly make cakes and cookies for my friends. What a terrible friend I am! And as if you didn’t think badly enough of me already, I have to unburden my soul and confess just how awful I am. 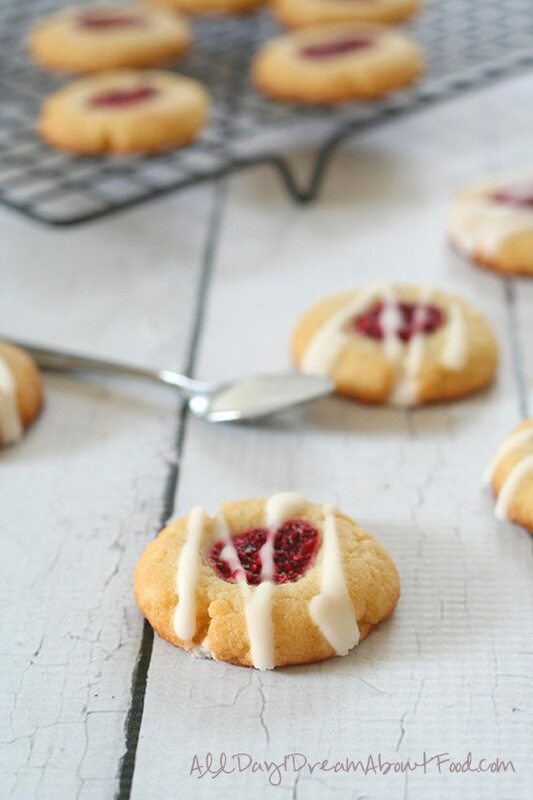 Because these delightful little bites of gluten-free shortbread heaven are as selfishly motivated as any birthday creations. Perhaps more so. They are in honour of Regan Jones on her 40th birthday, as part of a virtual surprise birthday party. Surprise, Regan! I made you cookies! But you live in Georgia and I live in Oregon so you can’t eat them. Guess I will just have to eat them all myself. See what I mean? So selfish! But I do love Regan and I am delighted to take part in her virtual birthday party. And I really wish I could share these cookies with her; I know she’d love them. Regan and I have gotten to know each other through the folks at Cabot, and she’s a dear. She also happens to be the brainchild behind Healthy Aperture, a photo and recipe sharing site for healthy food bloggers, and one of the masterminds behind Recipe Redux. When you meet Regan in person, you can’t help but love her. She’s direct and straightforward, with a great sense of humour and she has a smile for everyone. She also loves a good cocktail and has a healthy sweet tooth, but prefers her treats to be sugar and gluten-free. So the theme of her surprise party is cocktails and gluten-free desserts. Now that’s my kind of party! Happy birthday, my friend. Welcome to your 40s! It’s good on this side of that great divide. And I really do wish you could taste these cookies. They are delicious – and I am not so selfish that I didn’t share a few with my kids in your honour. They were a huge hit! Be sure to check out all the other delicious cocktails and treats made by Regan’s loving friends in the links below. 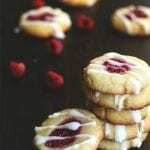 Tender almond flour shortbread cookies filled with sugar-free raspberry chia seed jam. A great low carb treat for a special event, or any day! In a medium bowl, whisk together almond flour, coconut flour and baking powder. In a large bowl, beat butter with sweetener until well combined and fluffy. Beat in egg yolk and almond extract. Beat in almond flour mixture until well incorporated. Form dough into scant 1 inch balls and place two inches apart on prepared baking sheet. Press each ball down to about 1/2 inch high. 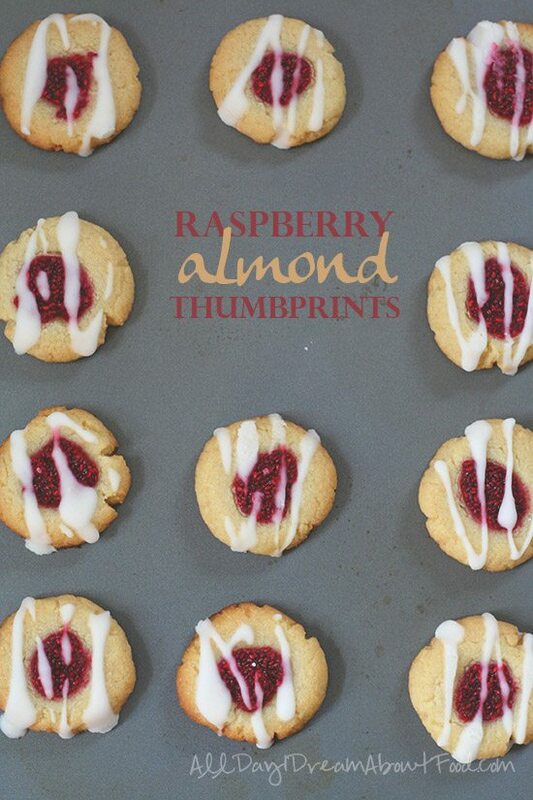 Using your thumb, press an indentation into the center of each cookie. Spoon about 1/2 teaspoon of jam into each and bake until just barely browning around the edges, 10 to 12 minutes. Cool on pan. The cookies will not seem set but will continue to firm up at they cool. In a small bowl, whisk together sweetener, almond extract and water until a pourable consistency is achieved. Drizzle over cooled cookies. Serves 12 (2 cookies per serving). Each serving has 4.98 g of carbs and 2.44 g of fiber. Total NET CARBS = 2.54 g.